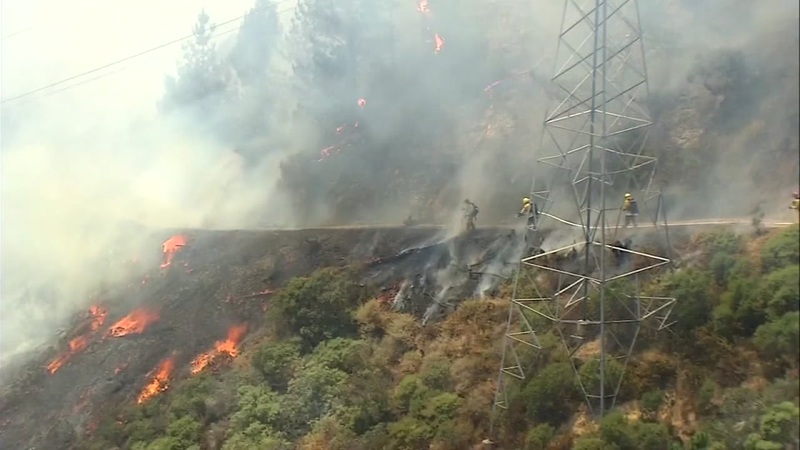 OAKLAND, Calif. -- Officials said a 20-acre vegetation fire that broke out last week in Oakland near Grizzly Peak Boulevard is now fully contained. Multiple fire departments worked together and made "remarkable" progress over the weekend in fighting the blaze, which was reported at 1:05 p.m. Wednesday near Grizzly Peak Boulevard and Centennial Drive above the University of California at Berkeley Botanical Gardens, Battalion Chief Melinda Drayton said. Half of the fire was on Oakland land in the hills and half was on land owned by the Lawrence Berkeley National Laboratory that's mostly in Contra Costa County, according to Drayton. University of California at Berkeley police spokeswoman Sgt. Sabrina Reich said Thursday that the fire is being considered as a possible arson. But Cal Fire Battalion Chief Mike Martin, whose agency is leading the investigation into the cause and origin of the fire, said the only thing he can say is that there's an open investigation into the fire and the probe could take days, weeks or even months. Also on Thursday, Oakland police said UC Berkeley officers arrested a person who fled the scene of a collision on Grizzly Peak Boulevard that occurred Wednesday morning, near where the fire began. Police haven't said whether that incident is related to the blaze. Drayton said anyone who has information about the fire should call UC Berkeley police at (510) 642-6760.